Mojito - A recipe from Savor California, the online showcase for extraordinary gourmet foods and beverages from California. 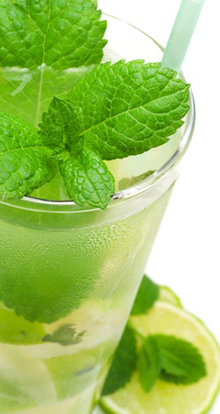 Place mint, lime juice and Mint Infused Syrup in tall glass. Gently muddle with spoon until you can smell mint aroma. Put ice in glass. Add rum and fill with soda water. Stir with a long spoon and garnish with mint sprig and lime wedge or a sugarcane swizzle stick.